excellent value if you dont mind your television pulling 3-4 times the amount of juice as a modern led backlit. Had 1 on the shelf in Asda,Antrim,N.Ireland yesterday also. What's advantage of plasma over led ?? Only 720p if that matters to you but a good price for this. £269 is an amazing price, I'm surprised it even has 720p!! It's an older technology so its cheaper! I have an old plasma and a newer LED and the plasma picture wins hands down. both are 1080p though. not sure what this one is like? Plasma apparently has (or had - LCD and LED have been around now, so I expect have improved) better blacks/contrast... still don't think it's that great a deal I'm afraid. 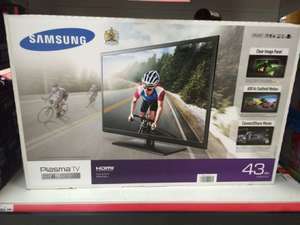 excellent value if you dont mind your television pulling 3-4 times the … excellent value if you dont mind your television pulling 3-4 times the amount of juice as a modern led backlit. This runs at 89w - our 40" Sony LED runs at 65w. Better black levels, better motion, better uniformity, better viewing angles, better colours. Most videophiles prefer plasma, they can accept the downsides as a tradeoff for amazing PQ. Sadly it lost the display war so it's pretty much dead now. OLED is the spiritual successor to Plasma because like Plasma it's emissive and shares many of the advantages like black level etc. It will gradually become affordable over time. Better black levels, better motion, better uniformity, better viewing … Better black levels, better motion, better uniformity, better viewing angles, better colours. Basically better picture quality in most areas but with some downsides:-less reliable (more prone to developing problems over time)-lower peak brightness (less suited to bright daytime viewing)-more power consumption-more difficult/expensive to make 1080p (entry level sets are all 1024x768)Most videophiles prefer plasma, they can accept the downsides as a tradeoff for amazing PQ. Sadly it lost the display war so it's pretty much dead now. OLED is the spiritual successor to Plasma because like Plasma it's emissive and shares many of the advantages like black level etc. It will gradually become affordable over time. and without putting a downer on oled (as it does look good), it also shares similar negative traits such as picture darkening over time and the potential for screen burn in (similar to the old crt's but its where an image has been on for an extended amount of time causing those pixels to be dimmer than the rest of the display). Better black levels, better motion, better uniformity, better viewing … Better black levels, better motion, better uniformity, better viewing angles, better colours. Basically better picture quality in most areas but with some downsides:-less reliable (more prone to developing problems over time)-lower peak brightness (less suited to bright daytime viewing)-more power consumption-more difficult/expensive to make 1080p (entry level sets are all 1024x768)., it also shares similar negative traits such as picture darkening over time and the potential for screen burn in (similar to the old crt's but its where an image has been on for an extended amount of time causing those pixels to be dimmer than the rest of the display). Are you a retired TV engineer from the 80's? An image does not stay on for extended periods on these 'new' sets. If viewing via an outside source like a dongle or a Humax box the TV image has an inbuilt limited freeze to negate 'screen burn'. Can't comment on the Sky sht. You again! Are you a retired TV engineer from the 80's?An image does not … You again! Are you a retired TV engineer from the 80's?An image does not stay on for extended periods on these 'new' sets. If viewing via an outside source like a dongle or a Humax box the TV image has an inbuilt limited freeze to negate 'screen burn'.Can't comment on the Sky sht. No, need to be rude. im somebody who has suffered screen burn in on an oled screen where a time area was displayed. If your watching channels on sky with a logo say in white, that area will be lit more with all rgb pixels which will deteriorate, resulting in the potential for patches on the screen to be burnt in (well sort of). First of all you comment on these sets burning 3 to 4 times the power, now you have had an old screen where a time area was displayed suffering screen burn. You should have started your comments with " I have have an old plasma set and these are my experiences". Hopefully you don't comment on new cars. First of all you comment on these sets burning 3 to 4 times the power, … First of all you comment on these sets burning 3 to 4 times the power, now you have had an old screen where a time area was displayed suffering screen burn.You should have started your comments with " I have have an old plasma set and these are my experiences".Hopefully you don't comment on new cars. not a plasma, an oled. and without putting a downer on oled (as it does look good), it also … and without putting a downer on oled (as it does look good), it also shares similar negative traits such as picture darkening over time and the potential for screen burn in (similar to the old crt's but its where an image has been on for an extended amount of time causing those pixels to be dimmer than the rest of the display). Yep, that's certainly true. The main advantage of OLED in this regard (compared to Plasma) is that Plasma was never, ever going to be used in portable devices, it inherently wasn't suitable. That hampered the R&D and investment in the technology big time compared to LCD. OLED on the other hand can and already is used in many portable devices. So while there are still lots of downsides, the R&D going into OLED currently and the economies of scale will hopefully solve or negate a lot of the issues. Yep, that's certainly true. The main advantage of OLED in this regard … Yep, that's certainly true. The main advantage of OLED in this regard (compared to Plasma) is that Plasma was never, ever going to be used in portable devices, it inherently wasn't suitable. That hampered the R&D and investment in the technology big time compared to LCD. OLED on the other hand can and already is used in many portable devices. So while there are still lots of downsides, the R&D going into OLED currently and the economies of scale will hopefully solve or negate a lot of the issues. true, let hope they can be made to last much longer without existing burn in issues. Sorry dear, my apologies but you really were - well! Didn't think that you would now go on about OLED on a plasma deal, really thought that you had misspelt. .not a plasma, an oled. Didn't think that you would now go on about OLED on a plasma deal, really thought that you had misspelt. [/quote]somebody mentioned advantages of led over plasma. in context, i provided a similarity with plasma which is a disadvantage of both. now why dont you stop trolling. [quote=bouncy99] excellent value if you dont mind your television pulling … [quote=bouncy99] excellent value if you dont mind your television pulling 3-4 times the amount of juice as a modern led backlit. You don't like being wrong do you? This runs at 89w - our 40" Sony LED runs at 65w.You don't like being … This runs at 89w - our 40" Sony LED runs at 65w.You don't like being wrong do you? OK you two, can we cut this out now please. I really don't want to start issuing infractions / suspensions but it's getting a bit silly now. Apart from what has been said they run at 600Hz which is great for gaming. I have a HD ready plasma and my friends agree it has much better picture than their full HD LEDs. So don't let 720 put you off. If it has freeview HD that does make a difference. Also it's great in 3D, the faster speed prevents any blurr. They are not as thin as an LED so allows for better speakers. The sound on my 51" Samsung 3D is very good but after Xmas I am going to invest in a sound system to get the full effect. You'll know if you have a good buy when the mates want to come round and watch your telly, like mine. Make sure they bring the bevvy. I wish everyone would stop comparing different technologies. It is what is it, a good deal on a reasonable TV. Quality plasma were always the best choice for Black levels, motion, reality of colours and refresh rates over any LCD TV. Technology is however moving on and future LCD / OLED tv's will probably equal plasma. My local professional Hifi centre were very upset that their best selling Panny plasma's were now discontinued. Cheaper and miles better. The latest plasma TVs look 10x better than LED backlit TVs. The only time I wouldn't get a plasma TV is if I got an OLED TV, and they're a few years away yet from becoming a reasonable price. Good deal, THANKS FOR POSTING. Spec wise this beats the Samsung hands down and it wont draw half as much power either! Read alot of comments about screen burn. I play video games on a 4 yr old LG 50 inch plasma, things like the HUD, health bar etc always burn into my screen however they disappear after an hour or two watching something else or turning the TV off. Not a problem for me but may be for some? I heard older ones burn permanently but not sure how true that is. Cold, roadie in the picture. Typically Plasmas are better for gaming too. Plasma warms the room in winter too! Not only a better picture ... but cuts your heating bills - may even pay for itself over the years. Plasma warms the room in winter too!Not only a better picture ... but … Plasma warms the room in winter too!Not only a better picture ... but cuts your heating bills - may even pay for itself over the years.HOT! there are no LED TVs for under quite a few thousand. they're LCD with LED backlit. The argument for better picture quality on plasmas has been weakening over the years. New LEDs (VA types) have amazing black levels. Deal posting newbie! This is Mooshizz first deal post. Help out by leaving a posting tip or just to show your appreciation for their contribution.